It's that time of year again! We pull out all our favorite snack recipes for watching the games. 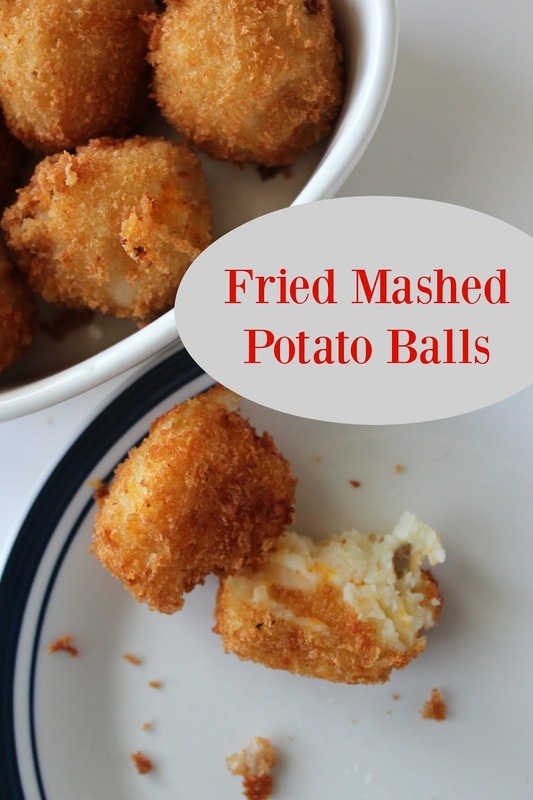 I love trying out new flavors and methods, and this fried mashed potato ball recipe did not disappoint! I had most of the ingredients in my pantry already, which is why I love this recipe! Simply mix the potatoes, egg, and cheese in a large bowl until blended. (For extra decadence, mix in a half cup of crumbled bacon and green onions into the potato mixture.) Roll mixture into small, 1-inch balls and then roll each ball into the panko crumbs. For extra flavor, season the crumbs with salt and pepper. Now, deep fry in your deep fat fryer or oil in a skillet on medium high heat. The balls are done when they float (in the fryer) or when you start to see the crumbs turn brown and potato oozing out. (Don't wait too long to take them out, however. Overcooked balls will cause the crumb mixture to fall off.) Set on paper towels to drain and serve immediately -- they're hot! Serve with ranch dressing, sour cream, or your favorite cheese sauce! Thanks! They were easy to make and the kids loved 'em. Oh yum Linsey. These look so good. I always have leftover mashed potatoes. We usually NEVER have any. So this was a rare treat! I have never heard of these before but I know that I would just love them. Thanks for sharing the recipe I like that you only need a few things to make these.